Cordelia was making tea when she had the idea. She looked down at her fat yellow teapot snug beneath its brown wool cozy. "Everything should have a cozy," she thought. So Cordelia began knitting. She made a cover for the kettle and one for the breadbox. She wrapped up her table and chairs, her lamps--even her toilet. When everything around Cordelia was encased in bright yarn, she moved out into the world. She covered door handles and mailboxes, lamp posts and stop signs. Hector the knife sharpener was a bitter man. Every day he drove his truck up and down the streets of their town, ringing his brass bell. People emerged from their houses, with their arms full of knives for him to sharpen. The people were like their knives, Hector thought, dull and blunt. He had constant headaches from the squeal of the grinder and the glare of sunlight on the blades. Hector was an expert sharpener, but even the best had accidents, and his hands were covered in scars. 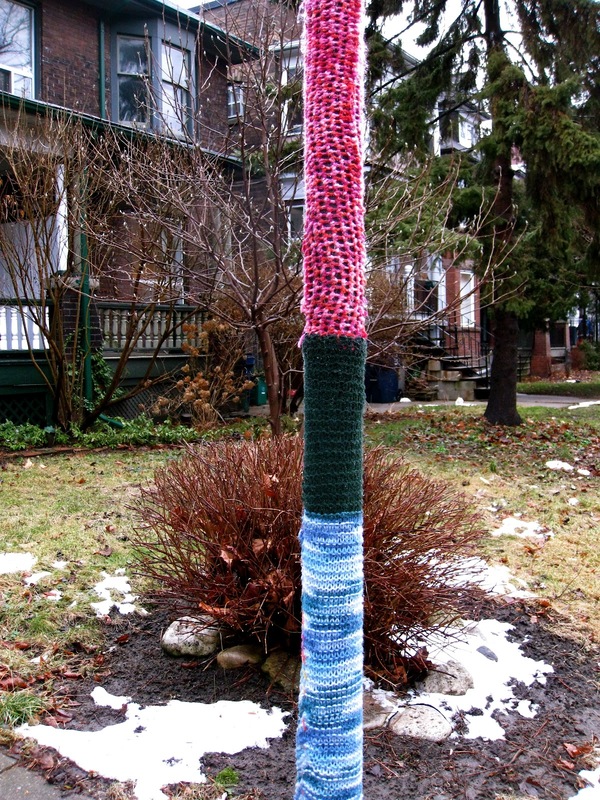 One morning, Hector turned onto Palmerston Avenue and discovered all of the lamp posts wrapped in wool. He pulled to a stop and took out his sharpest butcher knife. He lay the tip of the blade on the wool seam, preparing to split it open. Then Hector heard a voice behind him. He turned and saw a small woman with big brown eyes. "Don't cut it," she said, "please." Then she touched his scarred hands, gently sliding the knife from his grip. And everything for Hector became hushed and soft. Amazing timing, I just noticed a knit stop sign near my home the other day. I love the idea of yarn bombing, it makes us look at everyday objects that we are otherwise oblivious to seeing.